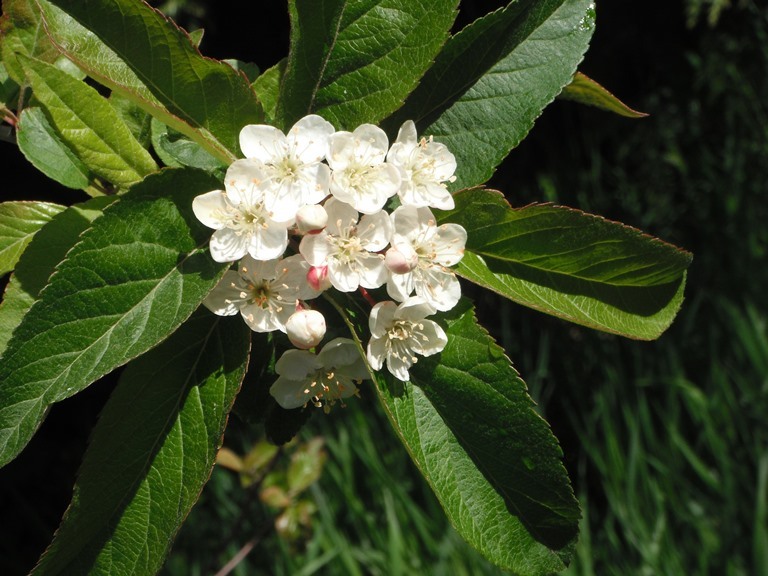 Names: Pacific Crabapple is also known as Oregon Crabapple. It has also been known has Pyrus fusca, Malus diversifolia, or Pyrus diversifolia. Pyrus is the genus name for pear. Fusca means dark or dusky, I am not sure whether it refers to its bark or the fruit after it ages. Diversifolia means different leaves, referring to the different leaf shapes, lobed and unlobed. Relationships: There are only about 25 species of apple in the northern hemisphere but there are numerous crosses and varieties, especially of the Eurasian species M. pumila. There are only about 5 species native to North America. 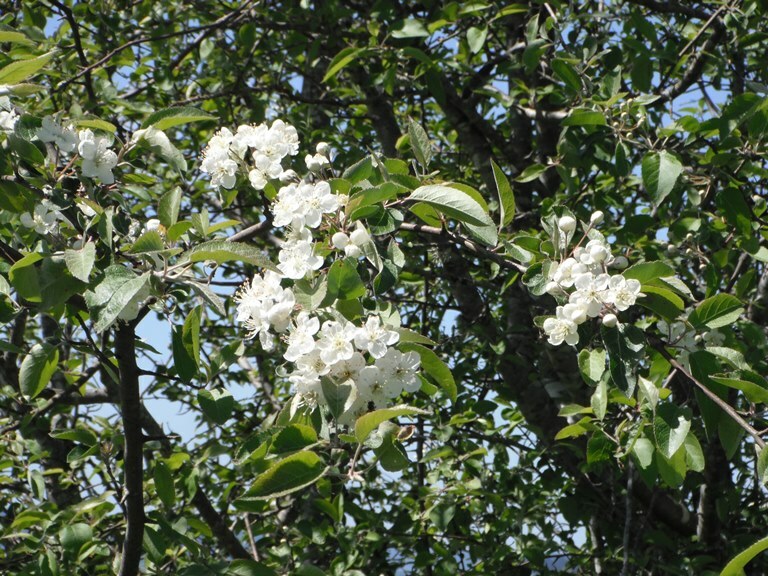 Pacific Crabapple is the only native apple in our region. Distribution of Malus fusca from Natural Resources Canada, Canadian Forest Service. Distribution: It is found from southern Alaska to northern California, along the coast on the west side of the Cascade Mountains. 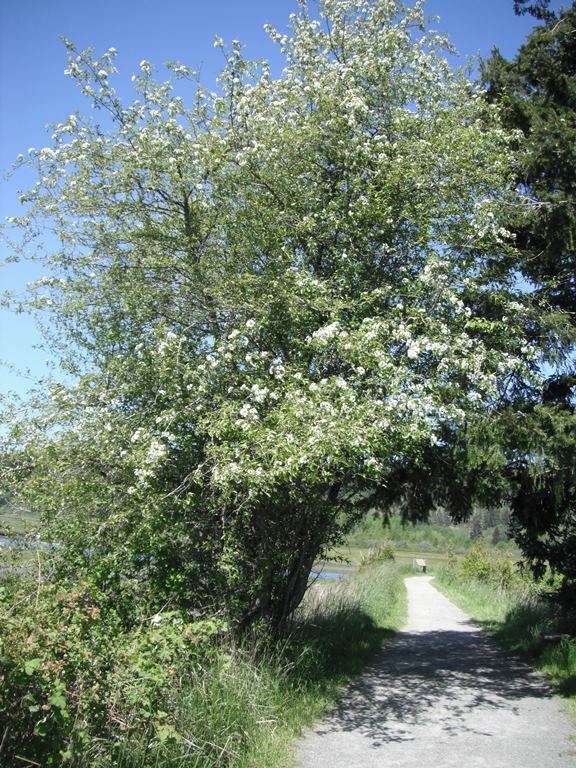 Growth: Pacific Crabapple grows relatively slowly to 36 feet (12m). Habitat: It grows in moist woods, and at the edges of wetlands and estuaries. Wetland designation: FACW, Facultative wetland, it has a higher probability of occurring in wetlands than non-wetlands. 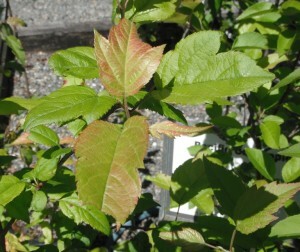 Diagnostic Characters: The leaves of Pacific Crabapple are irregularly lobed, with toothed margins, pointed at the end. Branches have sharp spur shoots as is typical for apple trees. Its fragrant apple blossoms are white to pink. Fruits are small (10-15mm), oblong, and yellow to orange to purplish-red. Older, reddish-brown bark becomes deeply fissured. In the landscape: it is useful for planting in wet areas and when a smaller tree is needed. In spring, blossoms are attractive and fragrant. 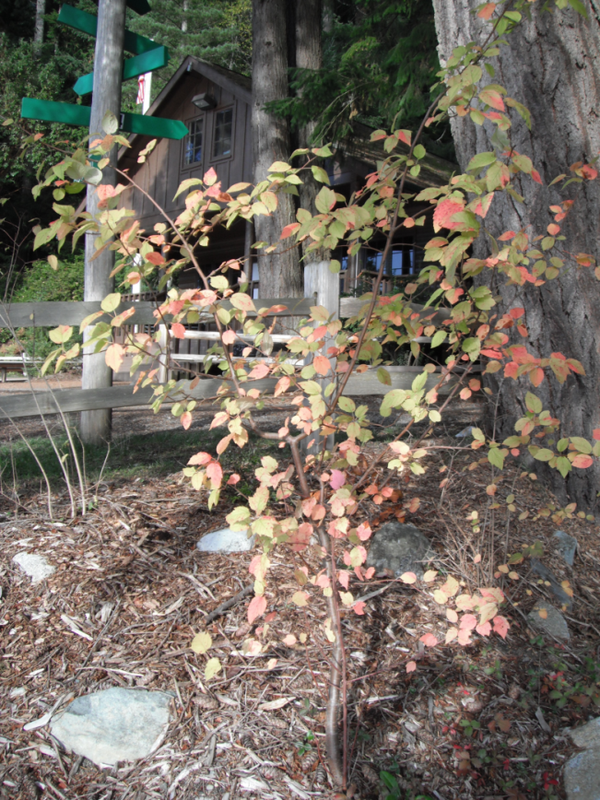 In fall, the leaves turn red or yellow-orange. Phenology: Bloom Period: April-May. 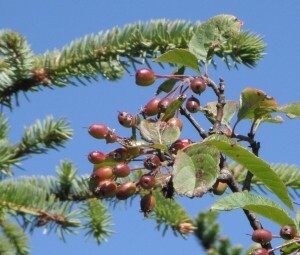 The small, pome fruits begin to ripen in August and September, but may hang on the tree through winter. 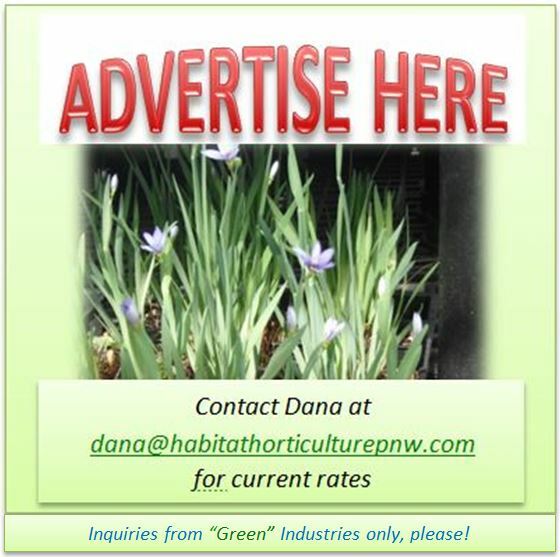 Propagation: Pacific Crab is usually propagated by seed, sown in fall. Fresh seed will germinate in late winter. Stored seed requires a cold stratification period for 3 months and may not germinate for 12 months. Cuttings of mature wood are best taken in November. 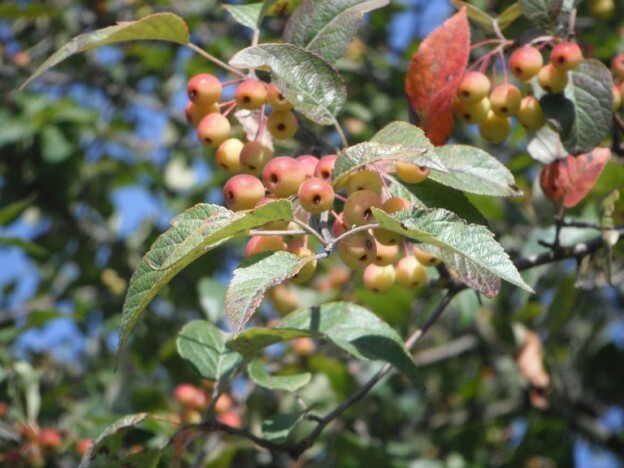 Use by people: Most coastal natives ate the tart crabapples. They were eaten either raw or after a storage period, after which they become softer and sweeter. 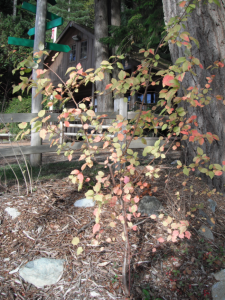 The bark was used medicinally for digestive disorders, an eyewash, and externally for wounds. Its use, however, should be limited due to the presence of hydrogen cyanide. The wood was used to make small tools, such as mallets. Like all apples its fruit is high in pectin and can be added to other fruits to make jellies. Use by wildlife: Apple leaves are well known to orchard growers as “deer candy.” We can expect that our native apple is just as appealing to browsing mammals. Leaves may also be host to butterfly larvae. Apple blossoms attract insect pollinators such as the mason bee. The fruit is eaten by several animals, especially birds. Pacific Crabapple also provides excellent cover for wildlife. This entry was posted in Broadleaved Trees on November 17, 2014 by habitatdana.